Great pic. What Spidey figure is this? 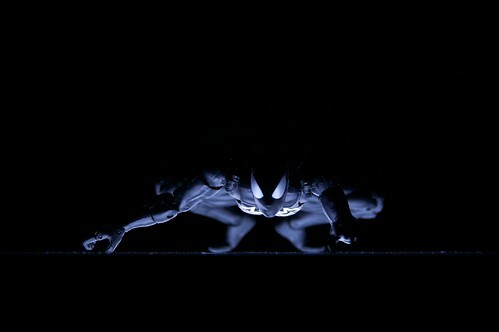 Nice lighting and setup for great mood, perfect for Spidey. Classic!All he needs now is a gargoyle. Most Impressive – is the Hasbro one from the target/red hulk series? It looks like the Toybiz one that came with a glider. Thank you for your compliments everyone. His paint apps are silver instead of white, if that helps identify him. I recently sold all of my Marvel Legends but I couldn't part with this guy. I've been on my holidays, so apologies for not responding sooner! Hasbro did release him as well, and may have also included the glider. I just remember getting this guy a long while before the Red Hulk black Spidey. Yep, he wasn't the Red Hulk release that's for sure, I picked him up in ASDA in the UK, no way you'd get that wave in there!